To Appear in the IEEE International Conference on Robotics and Automation, May 12 - 17, Japan, 2009.
have implemented the CCD algorithm with two different acceleration techniques which can handle rigid models, and have extended one of them to articulated models. The resulting algorithms take a few milliseconds for rigid models with tens of thousands of triangles, and a few milliseconds for articulated models with tens of links. We show that the performance of our algorithms is much faster than existing CCD algorithms for polygon-soup models and it is also comparable to competing CCD algorithms that are limited to manifold models. The preliminary version of this paper appeared in ICRA 2009. In the figure below, the hand model is composed of 21 links and 8k triangles, and the sphere of 2k triangles. 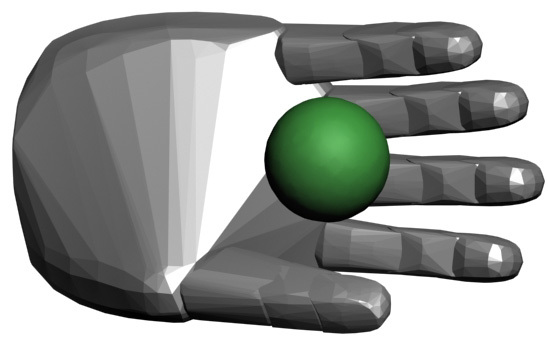 Our CCD algorithm is used to find the first contact between the hand and sphere during the approaching motion of the hand; it is then used again to find the ToC between the fingers and the sphere, as well as between the fingers themselves as they close. In the figure below, the red, blue, and green objects denote the club model at initial, final and TOC configurations respectively. The TOC configuration is computed by our continuous collision detection algorithm after linearly interpolating the initial and final configurations. The yellow object shows the configuration of an obstacle. There are more than 200 simulation steps in the benchmark, and in all trials no collision-free situation exists. A similar set up like the benchmark 1. 4. Rigid Body Dynamics for Bunnies: Using the same benchmarking (Rigid Body Dynamics for Bunnies) setup as FAST: http://graphics.ewha.ac.kr/FAST/. In the figure, the TOC configurations are shown as green objects. In the following graph, "*" shows the simulation steps when the TOC should be computed.